A while ago, I found several Drupal websites that have been compromised by the same sneaky malware. Since then I've encountered dozens more with the same symptoms. 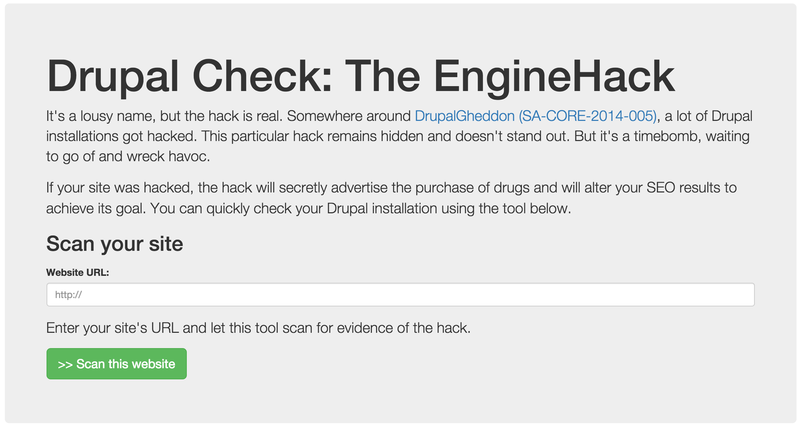 To facilitate detection and raise awareness, I've created a simple check-website that can scan your Drupal installation. The hack was originally discussed here: Drupal engine_ssid_ And engine_ssl_ cookies: You’ve Been Hacked. Since then, at seemingly random intervals, I've encountered more and more of these kind of hacked sites. So to make it easier for me and my colleagues to detect these hacks, I've put together a simple website that can check your own site: enginehack.ma.ttias.be. It doesn't have a fancy name and it lacks a logo, but I consider it a large-scale compromise of Drupal systems. It may even be huge, just not well known. Because the hack doesn't immediately stand out -- the site continues to work without issues -- there are probably many Drupal installations that have been hacked for months, where the site admin hasn't even noticed. Please use the scan on the website and share it with everyone who uses Drupal. I'm hoping every gets to see an "OK" message like this one. The confirmation page will list resources to help you deal with the hack, how to cleanup and how to get prevent a similar attack from happening.